FREETOWN, Jan 31 2012 (IPS) - The launch of Sierra Leone’s first online mining database in West Africa comes with a promise to increase transparency and accountability in the country’s rich natural resource sector. Launched on Jan. 19, the Government of Sierra Leone Online Repository System was funded by the European Union, and developed by the government and international donors, including the German Society for International Cooperation (GIZ), the United Nations Development Programme, the Revenue Development Foundation and the World Bank. The purpose of the system is to have information on all revenue data for the country’s extractive industry – payments made for licenses, royalties, and contributions to local chiefdoms – collected, recorded and published for public accessibility. It also shows whether mining companies have been authorised to legally operate in the country. For instance, the website shows Koidu Holdings, a South African company currently operating the largest diamond mining operation in Sierra Leone, made a cash payment of 200,000 dollars on Jan. 11. Sierra Leone’s mining industry has a long history of unregulated operations, most notably the “blood diamonds” which were found to be partially responsible for fuelling the country’s 11-year civil war. 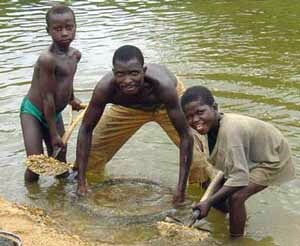 Apart from diamonds, Sierra Leone has significant depots of other minerals, including iron ore, bauxite, rutile and gold. In late 2011, African Minerals and London mining began the extraction of iron ore in the country for the first time in 30 years. According to the government’s projected budget for 2012, this mineral alone could contribute to more than 50 percent increase in the country’s GDP next year. This Online Repository System is also part of the move to make Sierra Leone compliant with the Extractive Industries Transparency Initiative, which requires the timely publication of payments made by mining companies to government, as well as revenues generated from the projects. Until now, information relating to mining agreement between the government and natural resource extraction companies was kept at the Ministry of Mines on paper documents that were neither secure nor accurate. In fact, old records were so poorly kept that the new system is only able to include information gathered after 2010. “Before the advent of this system when licenses and payment details were handled with paperwork, some payment details (went) missing and receipts were not found,” said Alusine Timbo, the Manager of the Online Repository System. Abu Brima is the Country Director of the Network Movement for Justice and Development, an organisation that has in the past taken a critical stance towards the extractive industry in Sierra Leone – particularly in regard to the transparency of deals struck between the government and foreign-owned mining companies. He says that any move towards a more public record of mining activities is a step in the right direction, but is concerned about the mechanisms in place that will ensure timely and accurate posting of information. The responsibility for ensuring the information is collected and reported falls on the government’s Strategy and Policy Unit (SPU) in offices around the country, in cooperation with the mining companies themselves. Sierra Leone is yet to enact its Freedom of Information Law that would constitutionally guarantee access to government records, like the original documents regarding mining agreements and transactions. “As much as the system is promised to address issues of corruption, I don’t think it will holistically address the problem when there is the tendency for the officials of the ministry to only upload information that is in their own interest and not crucial information that the public will want to know about,” said Mohammed Konneh, Secretary General of the Association of Journalists on Mining and Extractives. “Without the law the system will not work well more so the people that are responsible to run the system will in some cases will be afraid to put certain information that the government considers confidential,” he said.